The first US state to ban the use of animals in cosmetics testing, California has made US history once again by outlawing the import and sale of animal-tested cosmetics products statewide. Celebrated by ADI, California’s Cruelty-Free Cosmetics Act (SB 1249) recently passed both the Senate and Assembly then moved to Governor Jerry Brown’s desk. On Friday, September 28, Governor Brown signed the legislation, and the act now becomes law, making it unlawful for a manufacturer to import or sell any cosmetic product or any of its ingredients if they were tested on animals on or after January 1, 2020. 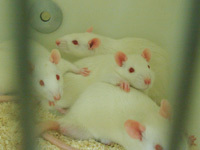 Elsewhere in the US, animals still suffer for cosmetics testing. ADI supports The Humane Cosmetics Act (HR2790), a federal bill that would prohibit cosmetics testing on animals within a year, and the sale and transport of products so tested after three years. HR2790 is sponsored by US Representative Martha McSally, with 173 bipartisan cosponsors. Public citizens can support the bill here.